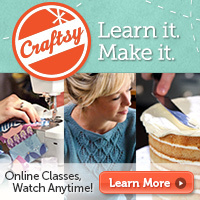 ← Tess Money’s Custom Crocheted Holiday Stocking!! Last night, we went to Tiffany and Daniel’s house for their holiday party and white elephant gift exchange. She made dericious cookies by crushing up Candy Cane Joe Joe’s…YUM! I wasn’t quite sure what to bring for the white elephant. 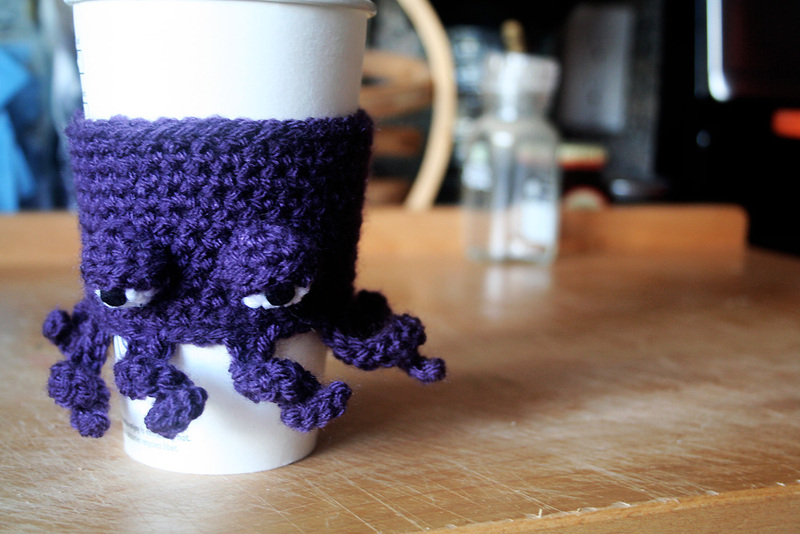 I almost brought a jar of Baconaise, but Hairy made a face like it was the worst idea ever, so I made something instead: a crocheted octopus coffee cup cozy. I wanted to make something somewhat unisex, even though most of the stuff I design tends to be really girlie! So if you follow me on Twitter and wondered why I asked what color you think octopi are, now you know! I might post this as a free pattern later, but right now, I still have to crochet some Christmas presents! Haha! I love the expression on its face! Please post the pattern! My brother-in-law would flip for this. Never too early to start crocheting for next Christmas! What a great idea!! He’s absolutely ADORABLE!! I’ll be sure to keep my eyes open for the pattern!! I’ve got your book & have used MANY of the patterns–they are so easy to follow!! 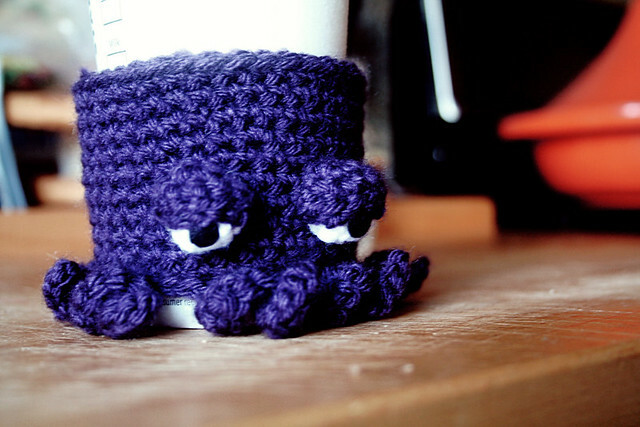 I’m working on amigurumi for a Con in Feb–this would be so cool as a wrist band for the kids!! Middle School Con & I am the exclusive amigurumi lady!! The kids would go nuts!! Thanks again for sharing–hope you finish all those last minute gifts. Have a Merry Christmas & a Very Prosperous New Year!!! Amigurumi is one of my favorite things to work with–the kids are always amazed that I make them all myself! Their appreciation is always genuine. Sure I could figure it all out–but would help if I had directions for the eyes & the suggestion of the Cthuluh is awesome!! Thanks again for sharing your talents!! WHaaaaaaT!? Mind-blowing amazingness! I love the eyes. THank you! I had seen some crocheted eye lids out there a while back and always thought it had such a funny and peculiar look! It is wonderful! 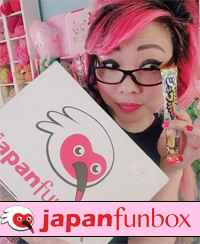 please keep making more fun items! 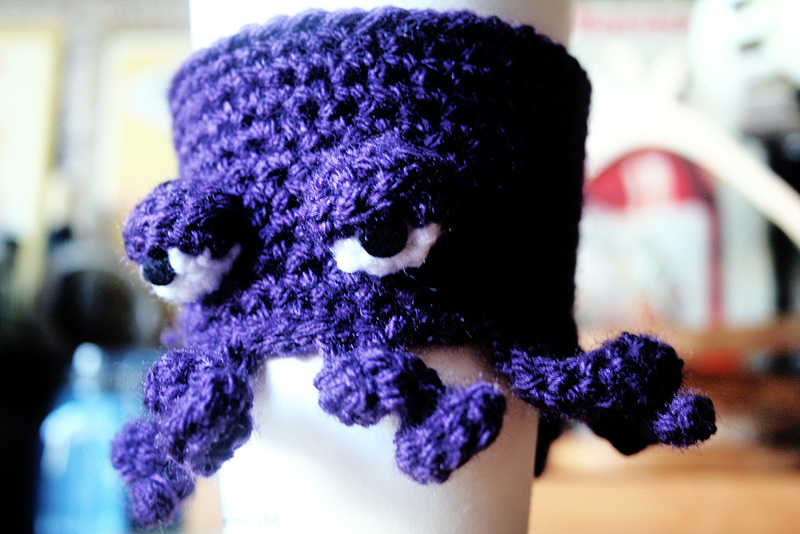 The eyes are so expressive on the octopus. LOVE IT. With a couple monir alterations you could make it green and call it a Cthulhu for science fiction nerds like myself. You totally nailed the ‘pre-first-cup-of-the-day-‘why-the-eff-am-I-awake’ glare! Wake up, look in mirror, this is what I see staring back. Without fail. he totally looks like he needs a cup a joe! LOVE it! This is so adorable. I would love to make on for myself and my boyfriend. 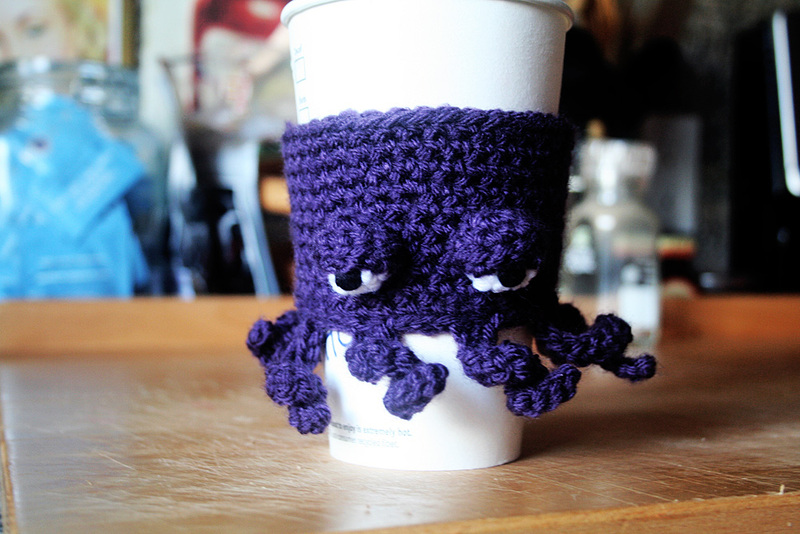 I would learn how to crochet, just to be able to make this! love it,i hope that can make it for myself if i can,thank you for these pattern and your designs .All of them are so pretty. LOVE IT! My wife’s favorite animal is the octopus, and I’d love to get one of these for her. Any chance you make them to order? It is amazing! 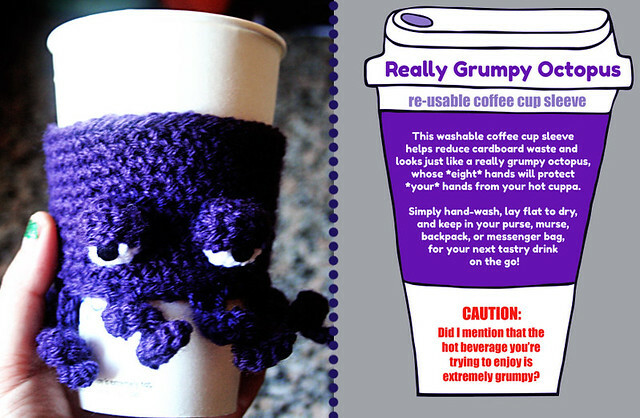 Would love to make these for all my grumpy friends. I wanted to add my request for the pattern as well.